An annual Meeting for summarizing and planning of the Network of CBA partner Universities took place on 4-6 February 2015. This year the event took place at National University “Ostroh Academy”. During three days meeting coordinators from partner universities summarized the results of their work in 2014 and also developed a plan of activities for 2015. Head of National University “Ostroh Academy” Ihor Pasichnyk opened the event. In his welcoming speech he underlined that, “Without historic memory we cannot bring up the new generation of patriots. We are representatives from different universities. We all have the same aim – cultural and informational: to promote Ukrainian culture among Ukrainians and foreigners”. In terms of the meeting participants discussed the results of Network activities in 2014. Among achievements was creation of academic resource centers at universities and field visits for students in terms of curriculum. Such activities as Students debates, Summer school, Contest for students’ research papers were successfully held during 2014. Traditionally participants elected new Coordinator of the Network. 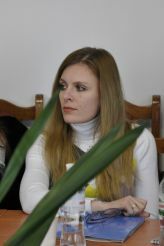 Mrs. Inna Dudareva (Zaporizky National University) headed the Network of CBA partner universities.